I did a retro on a 05 Avalanche awhile back but never posted it. Here are the parts..
Another problem I had is that my shrouds (E46-R extended) was hitting the headlight lens when I tried to place the headlight lens back on. I had to cut the the opening of the shroud (on the inside of it) bigger so I could slide the shroud further down on the projector. I couldn't slide the projector further back because of the limited space behind the headlight..
Last edited by xOperator; April 21st, 2011, 11:54 AM. very nice. love that colorband. I cant remember how much drop i had at 25ft. I've adjust it a lot to try to keep the reflection to a minimum. 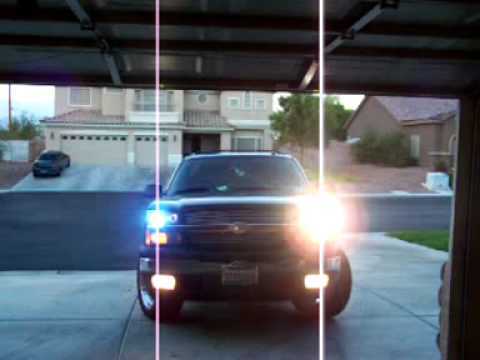 As far as your lights getting into the mirrors of cars in front of you, you're always going to have that issue since a truck's light is right around the same height of most car mirrors.